View of "Accion Iceberg", Informe SM, 2015. Escena Politica is an anonymous collective comprising Argentinian artists working in the fields of contemporary dance and theatre who aim to reveal the profound malfunctions of the Argentine state and particularly the city of Buenos Aires in the cultural sector. Together, they devise conferences, congresses, and actions in order to attempt to define the contours of what could be representative cultural policy not only of the diversity of contemporary creation but, above all, of its reality. Mathieu Loctin: Could you tell us about the evolution of Escena Politica and the political and cultural context in which it emerged? Escena Politica: We got together early in 2015 to produce a series of actions that aimed to make the dark areas of political and cultural production visible. Throughout that whole year, our interventions raised questions about the cultural policy of the city of Buenos Aires and particularly about its theatre complex, with seven of the largest public theatres in the country. Throughout the last decade, these venues suffered from a political and institutional abandonment and defunding that was totally out of phase with the intense activity of the production of the independent theatres. We questioned this contrast and saw in it the necessity to intervene more actively in state cultural policy. EP: Before his election to the presidency in late 2015, Mauricio Macri had been the head statesman of the city of Buenos Aires since 2007 and was, in this capacity, in charge of most of the cultural policy that we are calling into question. It’s not so much that the government does not accept us; subsidies do exist, even if they are very token gestures. Our actions do not necessarily aim to obtain more income or workspaces, but instead to propose different modalities of governance and production that reflect what constitutes the practice of independent artists. 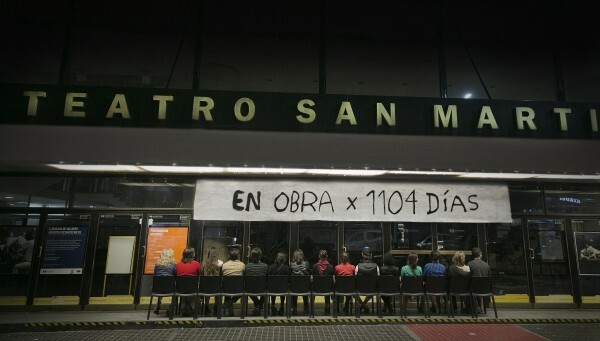 The problems that are notably encountered by Teatro San Martin have existed for a long time. From the earliest months of an openly neo-liberal government, our cultural and civil rights became vulnerable. The government shielded itself with a discourse highlighting the state’s effectiveness and a reduction of public spending, but in reality we observed the emergence of a powerful police or punitive state. We are experiencing a period of repression, a complicated political time, devastating on the social and political levels. The question is that of knowing how we position ourselves within this situation, this reality. ML: In order to interpellate the political class as well as the public regarding this climate of advanced cultural abandon, you led a series of actions entitled acciones iceberg. 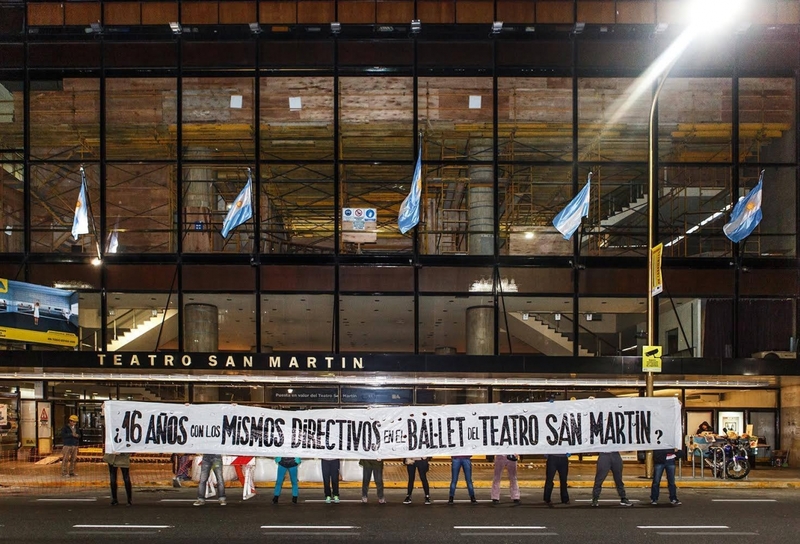 How did the problematic situation of the Teatro San Martin act as a trigger? ML: How are these actions organised? How did you decide on the form these would take and to what extent can we, or can’t we, consider them according to aesthetic criteria? EP: The first action (Valet) concerned the fact of asking ourselves questions: about the ballet, its director, the budget of the Teatro San Martin, and its dance studio. We didn’t want our faces to be visible. We designed anonymous public signs. We held them so that our faces could not be seen, only our feet. In a way, that in itself generates an aesthetic: bodies that become or are signs. We had the signs made at a place specialising in road signage with bold lettering, in capital letters. We did that late at night outside the theatre, since it was an event. The idea was to make photo-performances of this action, in the manner of a report or a replica of the action. After that, these issues started to circulate. There was a series of aesthetic decisions – the type of sign, our placement opposite the theatre, the type of photo, how to communicate it – but the goal was not aesthetic: it was that of a political denunciation of the situation of independent dance. 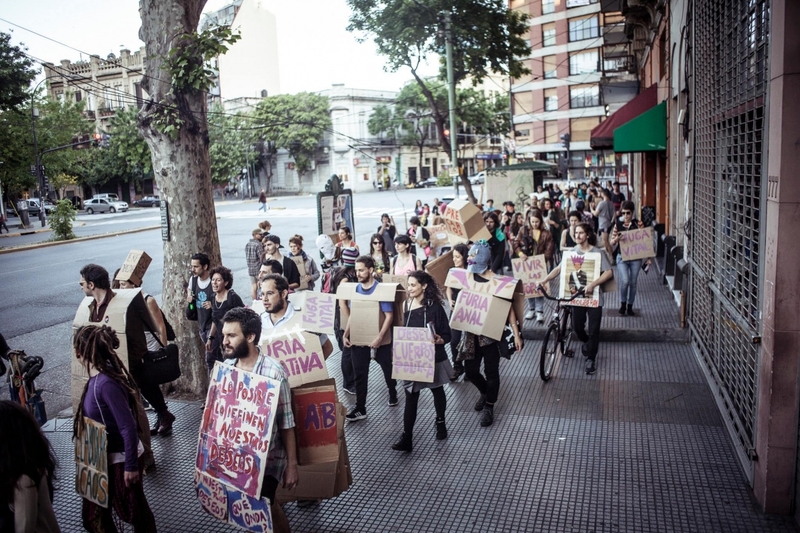 That led us to the next action (Informe SM) that consisted of creating a conference that would inaugurate a cycle entitled “Mis Documentos” organised by Lola Arias. She invited us, the Foro de Dansa en Accion (FDA), and the Teatro Independiente Monotributista (TIM), to hold a conference together. 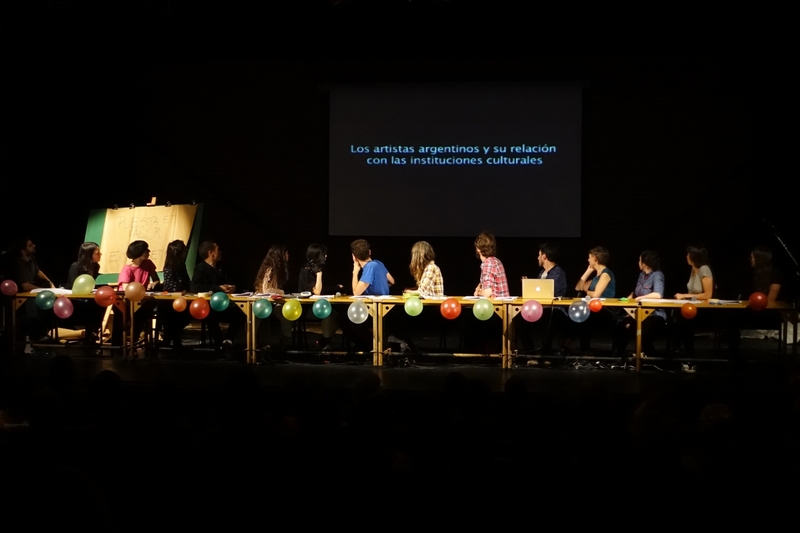 It took place according to the conceptual framework of a performative conference in which we presented real data that we had collected about the Teatro San Martin from the year 1978 to the present day. We showed how the ballet, the theatre and its budget had evolved and what its various directors had done. Another action (Postales) consisted of picketing in front of theatres that had been undergoing renovations for a long time or were closed. We also did photo-performances in the manner of a spectator shut out of a venue. 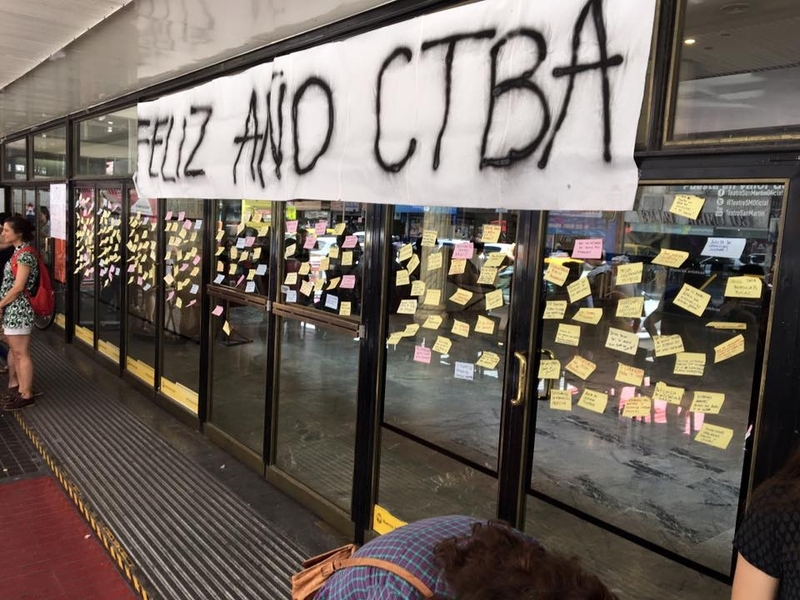 For the last action (Deseos), we put post-it notes with our wishes written on them over the windows of the Teatro San Martin, like New Year’s resolutions. Our desires and concrete complaints, although they were benevolent, avoiding any king of confrontation, since Argentinian society is very polarised politically: schematically, you’re either Kircherist, or Macrist.1 We evade all political organisations. Our collective is about analysis and discussion. What struck us as interesting about these actions was the possibility for an inclusive dialogue. ML: You also wrote numerous texts, including a manifesto, and organised a Congress. What role do you give to this textual production in relation to acciones iceberg? What is your relationship to theoretical production, to its necessity? EP: This production of texts is the result of the work of the study group that exists within Escena Politica. We held a congress, the “Congreso transveral de escena politica”, during which we tried to think about the relationship between art and politics, in order to think about our own identity. During its gestation period, a study group was created, through which we dedicated our time to studying texts by two theorists, Franco “Bifo” Berardi and Amador Fernández-Savater, who we feel close to and who we invited for the event. We had read a manifesto by “Bifo” and that helped us to identify certain essential problematics that we wanted to broach at the congress. We wanted to use these intellectuals as vectors for thinking about ourselves as a group, as well as to deal with the problematics we were dealing with. We wanted to see how these thinkers were resonating as part of our action. The practice of writing is something that is and must be in constant dialogue not only with what we are thinking but also what we are doing. Our way of writing and thinking as a group is established without there being any hierarchy or defined roles. Someone writes, someone else corrects. It takes the obvious form of a permanent conversation between all of us. ML: This horizontal organisation you mention, without hierarchy or leader, distances any form of personalisation of your movement. Your moments of speaking out are just as exclusively collective and anonymous as your interventions are. How would you describe the modus operandi of Escena Politica as an artistic and political community? EP: It’s an open community. That is one of the fundamental rules. We are not always the same and we don’t want a closed group, a frozen entity. The idea that we remain dynamic is important. We define ourselves in terms of identity and ideology by what we do. We are a community founded on emotion, in the present. The meaning of this community is not solely and uniquely structured around political or artistic questions, but also around more emotional questions. We form a community on several levels. What is happening is superior to any political ideas from the government that we are contesting. We are aware that the change that we can generate begins every time we speak or get together. In fact, we are continually involved in politics and then later, we transfer it to a different sphere. Escena Politica, like a platform, sees itself as a site of exchange, analysis, action, and association. ML: You all come from the field of the theatre arts, yet the actions that you undertake almost constitute anti-spectacle. Do your respective practices not have an influence on the production of your affirmative actions? EP: Even if we belong to the milieu of theatre and performing arts, our actions are anti-spectacle, static, and calm. We all have very different productions among ourselves and we don’t necessarily all agree in terms of aesthetic criteria. We are not a generation that would all produce a single work on theatre and dance. We are joining forces with a different objective in mind. We agree on the actions because we do not think about them in a spectacular way. We think about them in a performative way, which is not the same thing. There is performance or performativity and then there is spectacle. Collectively, we decided on this aesthetic, establishing strict rules that were very different from our individual work. Our movement aims to be a space where these concrete actions can be thought out, far from any kind of personal traditions. Cristina Fernández de Kirchner is a centre-left Argentinian politician. Mauricio Macri is currently the President of Argentina and leans more to the centre-right.